← Day 77: Community Gardening. Cauliflower. It’s right up there with broccoli and Brussels sprouts in terms of being one of the least popular vegetables on the planet. Merely the mention of it makes most children shudder in abject horror. Well, it seems to be attempting a bit of a comeback lately, with the all-important discovery of its deliciously silky smooth texture when pureed. Who knew?!! 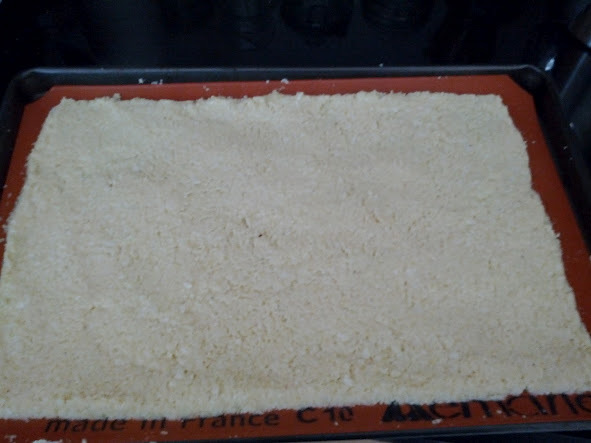 In the middle of pretty much nothing the other day, I happened to stumble across a recipe for making a pizza crust out of cauliflower that piqued my interest. Not only was it gluten-free, which is always a good thing for many of my friends these days, myself included, but it also had that freakish twisted factor that intrigued me straightaway. I wondered if I could fool a couple of my pizza aficionado friends into believing the crust was traditionally made with real wheat? Challenge accepted! Okay, so I need to come clean. I actually attempted this experiment on Wednesday, following the community gardening initiative. The real new thing today, then, was eating leftover cauliflower pizza if you want to get all technical about it. But still, the actual making of it counts as a new thing, at least on some level. As I texted my friends in a frantic effort to delay our lunch, I scurried into Loblaws and Bulk Barn, returning with everything to get started, at which point I decided to read the recipe with more than the previous passing glance. Junior chef error 101: always read the recipe thoroughly, and at least a day in advance, in case there is any special equipment or resting time required. Doh! The food processor saves the day! 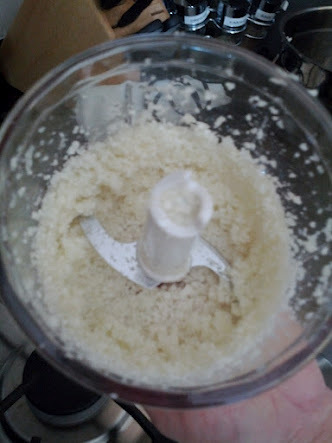 Apparently, this particular formulation called for a food processor, which I do not happen to own. 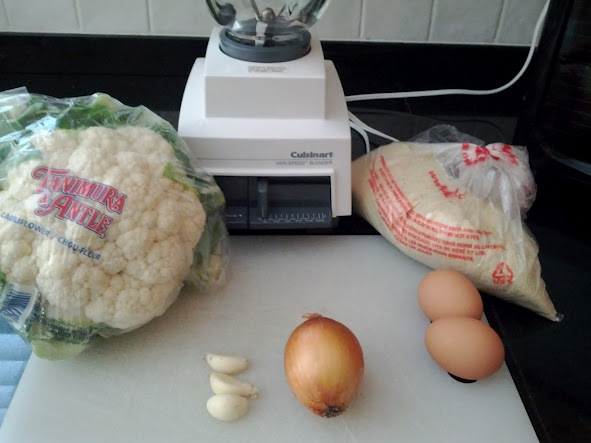 As it turns out, trying to finely chop cauliflower by hand or in a blender is not really the way to go, as you end up with some of it turning into a paste, and the rest of it staying pretty chunky and grainy. Thankfully, my friends arrived at this point, and the one who happens to be a very good cook rifled through my cupboards and found the hand blender with the food processor attachment. Right, I had completely forgotten about that particular contraption, go figure. Naturally, it worked like a charm. With that bit out of the way, we were able to combine it with the almond meal, egg, garlic and onion to form the dough, which we then spread onto a Silpat and baked in the oven, taking a stab at setting the temperature to 350 F. And we guessed wrong. It was clearly far too much effort to click through to the original recipe, where all these kinds of important facts were stored. in any case, it did eventually brown up, and resembled a crust, so we were happy enough to continue with the process. Okay, the rosé wine may have had something to do with keeping our spirits up, but, you know, details. The wine keeps the toppings company. At this point, the whole idea of trying to fool these guys as to the nature of the crust went out the window, since they were privy to the entire process. So I did what any quasi-intelligent lazy cook would do, and put them to work. 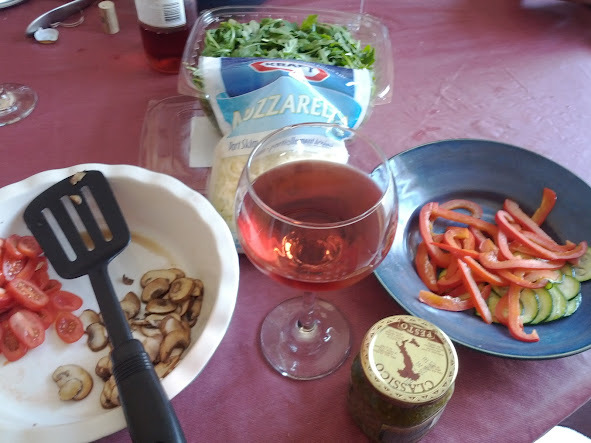 In no time, we had expertly sliced vegetable toppings that were perfectly sautéed and ready to go, giving us plenty more time to sip our deliciously fresh and summery wine. 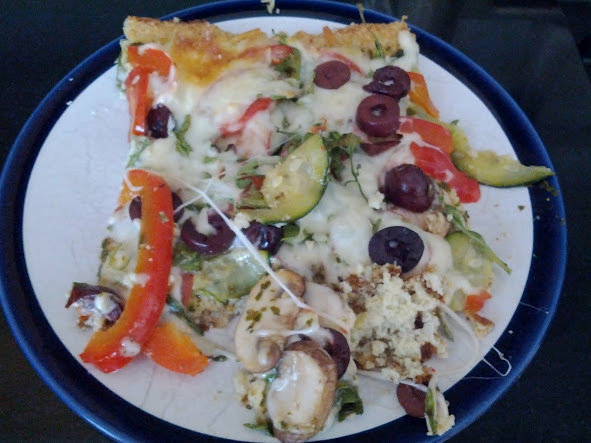 We then added a solid layer of store-bought pesto to the crust, and piled on the toppings and cheese, which included mushrooms, zucchini, red peppers, tomatoes, arugula, and olives. Back into the under-heated oven it went, where we continued to keep a careful half-cocked eye on it. Cauliflower crust cooked to perfection. Eventually, it was ready and we dove in, as we were quite famished, not to mention tipsy by this point. It was surprisingly tasty and delicious! Even my biggest pizza loving friend had to admit that it was a very acceptable alternative to the real thing. Phew! We all had seconds, it was that yummy. And the two wee slices that managed to avoid consumption until the following day did a stand-up job when reheated in the microwave. I would even venture as far as to say that they were even tastier that way. And that was without the wine, which had somehow managed to magically evaporate in the space of twenty-four hours… Stupid house-elves. It’s so hard to find good help these days. 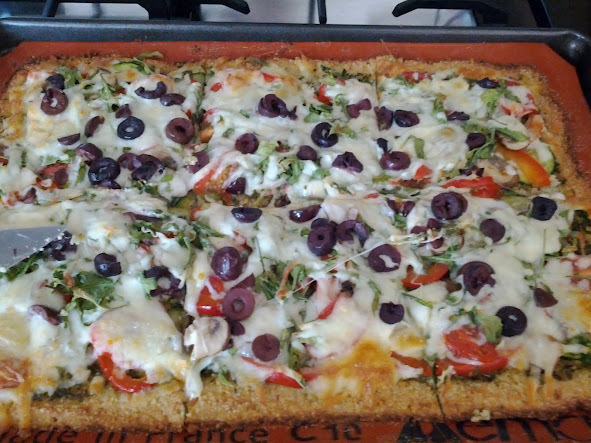 This entry was posted in Food and Drink and tagged cauliflower, Drink, Food, May, pizza crust. Bookmark the permalink.